The September 2013 issue of Harvard Business Review features four articles on women in leadership, which will be of interest to many people who work at historic sites and museums. The first is on the subtle gender bias that obstructs women’s access to leadership in even the most well-meaning organizations (and how to correct the problem), the second article describes companies who have successfully incorporated inclusivity, and the third reveals the way women make buying decisions differently in a business-to-business (B2B) setting from men. The fourth article is a roundup of recent research on women in the workplace, such as women receive less criticism but also less challenging assignments. Of course, the museum and historic site field is dominated by women, so I wonder what these statistics would look like for us. The same technique can be adopted by historic sites who are seeking to increase visitor revenue and satisfaction. Mapping their journey goes far beyond evaluating just the tours or exhibits. A visitor’s experience of the site starts long before the tour starts, and as we all know, their evaluation of the site and organization can be seriously affected by hard-to-find parking or a confusing ticket purchase. 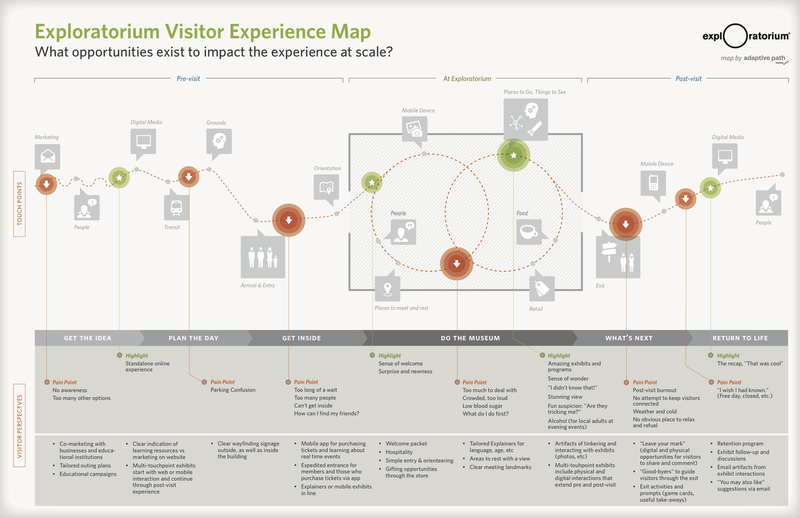 A simple Customer Journey Map for a visitor traveling from home to a museum and returning home.. The process of creating a “customer journey map” or “visitor experience map” starts with a staff team identifying all the touchpoints for a particular visitor, such as tourists or local residents. Each touchpoint or experience where the visitor interacts with the site (either directly or indirectly) is identified from start to finish. This could include a guidebook, website, highway signs, admission desk, parking lot, tour, restaurant, gift shop, and exit gate. These touchpoints are arranged from start to finish, and then evaluated individually. This becomes the start of a plan to improve the visitor experience. Wired Canvas of London offers a free workbook for arts organizations to explain the process in detail. Although incredibly useful, I haven’t seen them adopted by historic sites. There are variants, such as a circulation path for the grounds, as a way to organize a heritage trail, or providing pre-visit and post-visit activities for school programs, but nothing at the depth of a customer journey map. Even among museums it seems to be rare although I found a great example for the Exploratorium. This year they moved to a new larger facility in San Francisco and in preparation worked with Adaptive Path to create a visitor experience map starting with the premise that, “the future Exploratorium, online and off, offers new opportunities for visitor engagement. The co-creation of a customer experience map can help us all see how to integrate, extend, and deepen these visit experiences.” In their process, they developed an ideal “happy path” and then examined each of touch points to describe the visitor’s behavior, feelings, and thoughts along with the potential highlights and pain points from “get the idea” to “do the museum” to “return to life”. Alex Rawson, Ewan Duncan, and Conor Jones take this idea a step further in their Harvard Business Review article, “The Truth About Customer Experience.” They suggest that the usual customer mapping process enforces a siloed focus that loses the overall visitor experience. Visitor interaction at each touch point may be high, but overall experience may be low. How is this possible? As an example, they point to a cable television company whose customers may be satisfied with a service technician’s ability to resolve a problem (a touchpoint) but frustrated by the numerous calls for service (which is not evaluated). Secondly, the cable company wasn’t monitoring the transition or handoff between touchpoints, so service technicians were unfamiliar with channel packages or options promoted by the sales staff. Most of the article is devoted to explaining each of these points. Customer journey mapping is a novel idea for museums and historic sites, but reinforces the need to be more visitor-centric in our exhibits, programs, and fundraising to be sustainable. 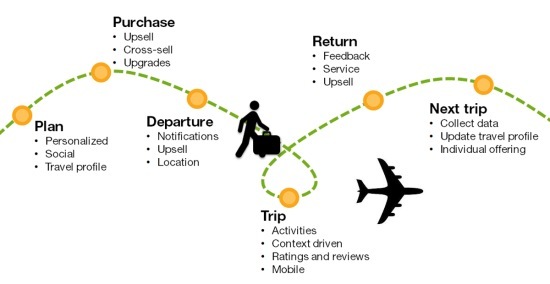 The authors warn that, “journey-based transformations are not easy and they may take years to perfect, but the reward is higher customer and employee satisfaction, increased revenue, and lower costs.” If anyone knows of a museum or historic site that developed a customer journey map and is using it to guide their work, please share it in the comments below. This entry was posted in Community engagement, Emotion, Governance and management, Historical interpretation, Performance measures, Strategy and tagged Adaptive Path, Alex Rawson, Conor Jones, Customer journey map, Ewan Duncan, Exploratorium, Harvard Business Review, leadership, Visitor experience map, Women on October 15, 2013 by Max van Balgooy. Thanks for this! I realized that this process not only works for museums, but it also can work for many non-profits (e.g., community organizations, faith organizations, neighborhood organizations).